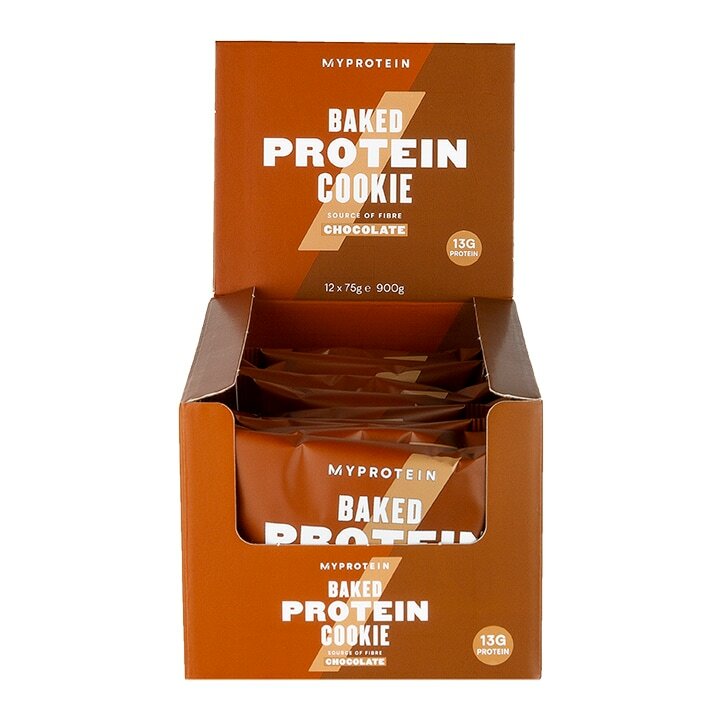 High in protein, Myprotein's Baked Cookie is a truly delicious, on-the-go snack. Crafted with premium dark chocolate, it'll satisfy your sweet tooth, without derailing your diet plan. It's baked from a rich dark chocolate dough, made using pea protein, coconut oil, stevia to sweeten, and a generous sprinkling of dark chocolate, for true indulgence. They're suitable for vegans too! Consume as a snack in between meals as required. Warning: Excessive consumption may cause laxative effects. This product should not be used as a substitute for a varied diet. Consume as part of a balanced diet and a healthy lifestyle. Store in a cool dry place, out of direct sunlight. Wheat Flour, Unrefined Brown Sugar, Oat Syrup, Vegetable Glycerine, Glutamine Peptides (Hydrolysed Wheat Protein), Dark Chocolate Chips (9%) (Cocoa Mass, Sugar, Emulsifier (Soy Lecithin], Natural Flavouring), Cocoa Powder, Pea Protein, Olive Oil, Soy Protein, Stabiliser (Gum Acacia), Coconut Oil, Water, Raising Agent (Sodium Bicarbonate), Flavouring, Salt. Myprotein Baked Chocolate Cookie is rated 4.9 out of 5 by 14.